It may just be me but I get the distinct impression that - "thanks" to Donald Trump's ill-advised and shortsighted decision to withdraw the U.S. from the Paris agreement - people have been hearing a lot more about climate change since June 1. As one datapoint, the topic got a lot of coverage on German TV on June 2 with for example about 8 out of 15 minutes dedicated to it in the main news at 8pm or 10 minutes out of 30 at 10pm. There has also been a lot of coverage in the international press as shown in this very helpful CarbonBrief analysis which lets you select articles by various attributes: Global reaction: Trump pulls US out of Paris Agreement on climate change. We can also tell that there seems to be more interest in the topic by looking at the statistics for visits to Skeptical Science. We for example had 48,000+ and 57,000+ unique visitors on June 1 and 2 respectively which is more than twice as many as we have on average and between 3 and 4 times more than on those days a year ago. Figure 1: Number of views for each rebuttal across the different levels available (basic, intermediate and advanced). 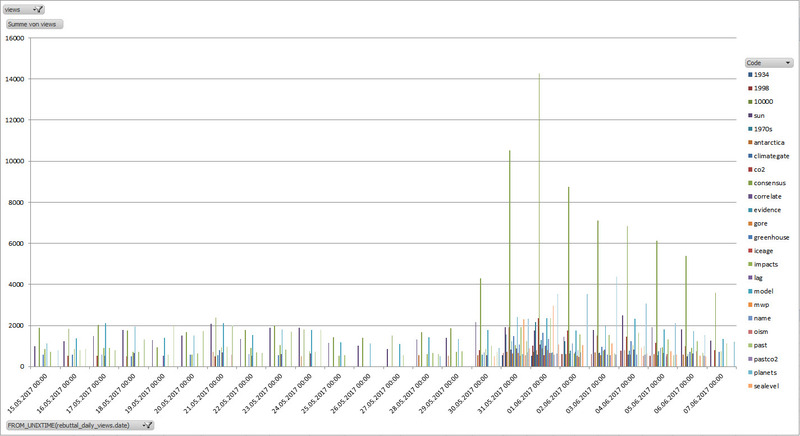 Shown are only rebuttals with at least 500 views on a given day. The big outlier is the rebuttal for "there's no consensus". Things get really interesting when looking at some of these rebuttals in more detail. In some cases it has also been possible to track down where a specific spike has been coming from, like e.g. a Tweet or an article. The most recent upsurge however seems to be mostly attributable to Trump's decision as it's happening for various rebuttals and not just individual ones. "Just to clarify, modern climate change is most definitely not being caused by “global cycles” or some “outer space cycles”. Here is some good information why." Bottom line: as bad as Trump's announcement regarding Paris is, it sure got the topic of climate change in front of many people who may not have heard much about it otherwise. Note: You may have noticed that the most viewed myths listed in this article are not the same ones as those shown in the thermometer in the left-hand sidebar. The reason for that is, that they are looking at different things. 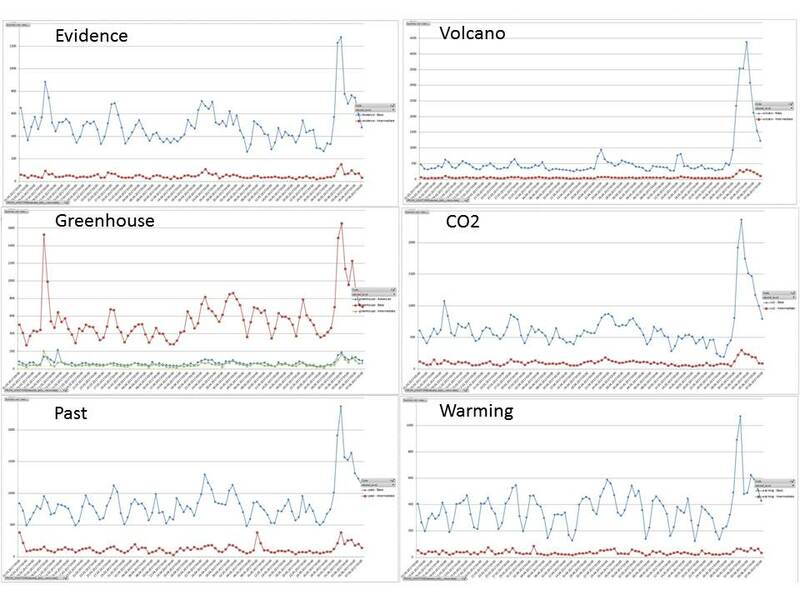 The rebuttal views count how often each rebuttal-version gets displayed each day while the underlying - and not neccessarily current - data for the thermometer is based on submitted mentions of a myth in the media. I think this is the same phenomenon as when gun sales went up after Obama was elected because the rhetoric from the right was that Obama was going to take guns from people. As long as global warming was a side issue that was being worked on, though at a snail’s pace, it was a low priority in most people’s lives. When it’s being made worse or not being addressed at best, a lot of people start to worry even if it is a low priority for them. You are right Trump's actions may inspire greater awareness of climate science, and greater efforts by other countries to reduce emissions, and this would be one positive outcome among the general mess. But I think this is what Trump wants, although he clearly largely thinks climate change is a scam and hasn't got much grasp of science. I think Trump has pulled out of Paris because he is looking for a free ride. It would be in character with his loans and inheritance from his parents, and his history of unusually brutal business deals, and the harsh way he treated his sub contractors. There's a pattern there. There's always someone that wont participate in group efforts to solve some problem, but is happy to benefit. It's parastical behaviour, and immensely hypocritical given Trump accuses other countries of relying on America. One thing that's worried me for some time is the lack of a date in the rebuttal listings. Given that one of the ways that deniers attempt to win arguments is to cherrypick data, relying on an out-of date rebuttal can inadvertently lose the discussion. It would be a big job to make sure each is actually up to current knowledge, but useful. [JH] Your concern about the currency of the SkS rebuttal articles is shared by the SkS author team. If you, and others, would like to help out in the task of updating the articles, please send us a note using the the "Contact Us" button on the bottom of this webpage.